were a riot! That little guy stayed so busy out in right field. His first priority was to pick up dirt from the infield, dump it onto the bill of his cap, tip his head forward and watch the dirt pour into his glove. Next on the agenda was to spin around like Wonder Woman until he became so dizzy, he stood like the Tower of Pisa and eventually tipped over. The thing is, he was so busy that when the ball finally did come his way, he didn’t even see it. He was so distracted from his purpose that he missed the play. He missed the opportunity that was right in front of him. It’s easy to become distracted, especially for leaders. All day long leaders are pulled in so many directions. You’re putting out fires. You’re knocking things off your “to-do” list. But for every one thing you cross off, two more are added. Before you know it, you’re caught in the chaos of the day and lose clarity on your main purpose or objective. When you lose clarity on those things that matter most, you miss the play. You miss the opportunities that may be right in front of you. Here are three simple steps to help you move from chaos to clarity and achieve those things that matter most. It sounds simple, and perhaps even obvious. But it’s often the first mistake leaders make. They’re stuck in the chaos talking about the projects that must get done. That’s when I ask the obvious question: “why are you doing this – what’s your main objective here?” The most common response is a long, pause and a look of uncertainty. Chaos can keep you busy. It can distract you from your key objective. Writing out your objective helps keep you on track. The most powerful objectives are those that are simple, clear and focused. Ask yourself before tackling each task if this task is directly linked to your clear objective. No doubt that you always will have more things to do than you have time or financial resources to do them. Every task might feel important. 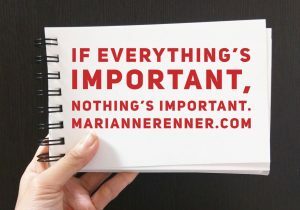 But if everything is important, nothing is important. You have to say no to some good things so you can say an even bigger “yes” to the great things. Identify those few, absolute tasks that are most likely to move you toward your objective, and say, “no” to everything else. I recommend using two criteria to help prioritize and determine what stays and what goes. What will have the highest impact on getting you toward your objective? What will be easiest to do? If a project or task gets a positive check mark for both criteria – it stays! If it hits neither or only one, then kick it to the side. You can download a great prioritization tool that will make it so easy to determine what goes and what stays. Get it here.